A clear grasp of economics is essential to understanding why environmental problems arise and how we can address them. So it is with good reason that Markets and the Environment has become a classic text in environmental studies since its first publication in 2007. Now thoroughly revised with updated information on current environmental policy and real-world examples of market-based instruments, the primer is more relevant than ever. The authors provide a concise yet thorough introduction to the economic theory of environmental policy and natural resource management. They begin with an overview of environmental economics before exploring topics including cost-benefit analysis, market failures and successes, and economic growth and sustainability. Readers of the first edition will notice new analysis of cost estimation as well as specific market instruments, including municipal water pricing and waste disposal. Particular attention is paid to behavioral economics and cap-and-trade programs for carbon. 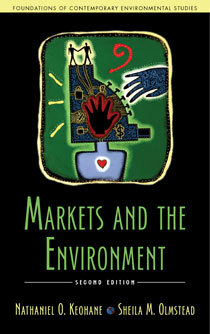 Throughout, Markets and the Environment is written in an accessible, student-friendly style. It includes study questions for each chapter, as well as clear figures and relatable text boxes. The authors have long understood the need for a book to bridge the gap between short articles on environmental economics and tomes filled with complex algebra. Markets and the Environment makes clear how economics influences policy, the world around us, and our own lives. "A well-structured, thoughtful, complete introduction to environmental and resource economics...highly reccommended." -Setting Prices versus Setting Quantities? -Waste Management: "Pay As You Throw"
-Are Economic Growth and Sustainability Compatible? -What Does Economics Imply for Environmental Policy? Check out Chapter 5, "Market Failures in the Environmental Realm" below.